In a large bowl, cream butter and sugar together until pale and fluffy, using an electric mixer. In another bowl, stir the flour and cornstarch together. Gently mix the flour mixture into the butter until it forms a soft dough. Cover the dough with plastic wrap and refrigerate about 15 minutes. Dust dough lightly with flour and roll it out to ¾ inch thickness on a piece of parchment paper. Transfer dough and parchment paper to a baking sheet and bake for 30 minutes, or until lightly golden and firm. Remove from oven and sprinkle with superfine sugar. 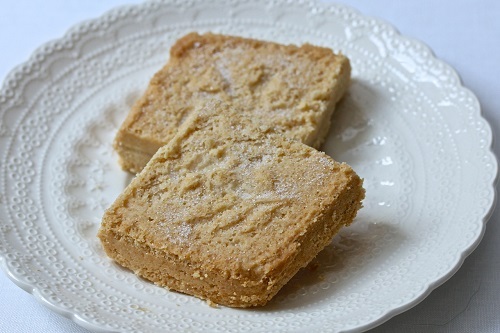 While still warm, use a knife to cut the shortbread into pieces. (I had a shortbread mold, which I used for this recipe. If you use a mold, give the shortbread five minutes less in the oven.